The word’s dependence on nuclear power generation is increasing every year, and the possibility of an accident or attack triggering a nuclear power plant disaster is a growing concern. But while the possibility is undeniable, the outlook is far from bleak; not only is nuclear power historically very safe, there are steps you can take to protect yourself and your family in the event of a nuclear power plant accident. There’s no doubt that nuclear power is a well-established and rapidly growing part of modern life. Nuclear power generation currently supplies about 14% of the electricity used worldwide; as of 2016, a total of 30 countries were operating 450 nuclear reactors for electricity generation, and 60 new nuclear plants were under construction. According to the U.S. Energy Information Administration, nuclear power use is increasing by 2.3% per year. France leads the world in nuclear power consumption, depending on reactors for about 75% of its electric power, and nine other European nations get more than a third of their electricity from nuclear power. North America is close behind, with the US generating around 20% of its power through a total of 99 nuclear reactors in 30 states, and Canada relies on 19 reactors for approximately 16% of its electricity. Nuclear power actually has an excellent safety record, with only three major accidents in over 50 years. In fact, no member of the public has been injured or killed in the entire 50-year history of commercial nuclear power in the U.S. But nuclear safety is closely linked with security, and the possibility of terrorism has joined inherent safety risks like aging equipment and operator error in fueling fears of a nuclear power plant event that could put the public at risk. Nuclear power plants generate electricity by converting water to steam, using the heat generated by splitting uranium or plutonium atoms in a process called nuclear fission. Though nuclear fission doesn’t directly produce radiation, it does result in the creation of unstable radioactive particles which create radiation as they decay. The power generator as a whole is referred to as a nuclear reactor, and the part of the reactor in which the fission takes place is a closed environment called the core. Complex cooling and containment systems are used to protect the core and its contents from the heat generated by the fission process. The worst-case nuclear accident scenario is often referred to as a meltdown, which can be defined as an overheating accident in which the reactor core is damaged and radiation is released into the environment. While even a partial meltdown is extremely serious, it’s important to separate fact from speculation and myth; fears that a meltdown can turn a power plant into a massive nuclear bomb are scientifically baseless. According to the Center For Nuclear Science And Technology Information, nuclear weapons detonate because they contain particular configurations of specific materials that are not present in nuclear reactors. It’s also important to understand that a meltdown doesn’t necessarily equate with a massive and catastrophic radiation release. Ukraine’s 1986 Chernobyl disaster, in which a total of 30 people died from acute radiation poisoning, was the only accident in the history of commercial nuclear power in which radiation-related fatalities occurred. The other two serious nuclear power plant accidents – Three Mile Island in the US and Fukushima Daichii in Japan – involved partial meltdowns of one or more reactors, but in both cases, the radiation escape was minimized, and neither accident resulted in any deaths or cases of radiation poisoning. However, the fact remains that any radiation escape is critical, and radiation exposure is the number one danger posed to the public by a nuclear crisis. Taking the following steps can help you and your family stay safe in the event of a nuclear power plant disaster. The US government’s emergency response plans for a nuclear accident include two separate planning zones, one for a 10-mile radius of the reactor where people could potentially be harmed by direct radiation exposure and one for a 50-mile radius, where food crops and water supplies could be contaminated by radiation. In addition, the US Nuclear Regulatory Commission has established four categories of nuclear emergencies, in increasing severity: Unusual Event, Alert, Site Area Emergency, and General Emergency. The only level at which radiation is expected to present a threat to the public is General Emergency, but if you live within 10 miles of the plant you are considered to be in the Emergency Planning Zone and may be alerted or instructed to evacuate at an earlier stage. In the US, about a third of the population lives within 50 miles of a reactor, and about 6 million people live within a 10-mile Emergency Planning Zone. If you’re unsure of your distance from the nearest reactor, click here for an evacuation zone finder provided by the Physicians For Social Responsibility. Alerts may include sirens, a radio tone, an automated call from a public safety warning system, or an in-person alert from emergency responders. If you receive an alert or warning, tune your radio or television to your designated Emergency Alert Station and wait for instructions. Important: Follow Emergency Alert instructions. If you’re instructed to remain in place, stay where you are and don’t attempt evacuation. Depending on the nature of the emergency and a variety of environmental factors such as wind speed and direction, evacuation could be much more dangerous than staying in place. If you are instructed to evacuate, do so immediately. If authorities specify a certain route or tell you to travel a certain distance from your current location, follow instructions without deviation. Unless you’re otherwise instructed by authorities, putting as much distance as possible between yourself and the site of the emergency may be your best option. If you live within 50 miles of a nuclear power plant, it’s wise to make advance arrangements that will allow you to leave the area quickly, with a minimum of confusion. Establish your own evacuation plan, complete with a preferred escape route that will take you out of the affected area as quickly as possible, and at least one alternate route that you can use if your preferred route is closed, congested, or otherwise inaccessible. If you have friends or family at a location at least 50 miles from your home, make advance arrangements with them to serve as your emergency destination and plan your route accordingly. If you don’t know anyone who can provide emergency shelter, determine well in advance what your evacuation destination will be. If you have pets, do some advance research to find pet-friendly lodging at your destination city. Indecision and confusion can create dangerous delays. Keep an evacuation kit, also known as a “bug out bag,” packed and ready to go. Prepare your evacuation necessities in a travel bag or backpack and keep it in an out-of-the-way location where it won’t be “plundered” for everyday needs but can easily be grabbed if an emergency occurs. Include cash, basic first aid supplies, a few days’ worth of essential medicines for family members and pets, flashlights, a transistor radio, batteries, and a zip-lock bag containing copies of your important papers (driver’s license, Social Security cards, proof of insurance, bank account and credit card numbers, and a list of personal contacts). Refer to our bug out bag packing list to help you pack. Pack minimally, but efficiently. Include enough basic clothing for a couple of days, all prescription and over-the-counter medicines regularly taken by anyone in the family, and simple hygiene necessities. Pack a bag, box, or crate with bottles of water, snacks, and pet food, and stow it in your car. Secure your home and let someone know you’re leaving. Lock windows and doors and shut off utilities if possible. If you’ve arranged for friends or family to serve as your emergency destination, contact them and let them know you’re on your way. If you don’t have a pre-set emergency destination, contact someone who lives anywhere outside the affected area and tell them you’re evacuating and the location to which you plan to travel. When you reach your destination, contact them again and let them know you arrived. Keep your vehicle sealed. Travel with windows up and vents closed. If you live within 50 miles of a nuclear plant, you may want to make advance preparations for a shelter-in-place order following a nuclear accident. Though shelter-in-place orders are usually brief, measured in hours rather than days or weeks, every situation is different and keeping a store of some basic supplies on hand can help you and your family get through an emergency. Store enough water for two weeks. Keeping an ample supply of stored water on hand is an important part of any emergency preparations, but it can be particularly important in the case of a nuclear accident because a radiation release could potentially contaminate water sources long after a shelter-in-place order is lifted. The US Department of Homeland Security advises families to store a total of at least one gallon per person, per day. Water doesn’t spoil or go bad, so if it has been properly stored, it can be used indefinitely. However, Homeland Security advises that stored water supplies be replaced every 6 to 12 months for best taste and maximum safety. If you buy bottled water, keep it tightly capped, mark it with the date purchased, and store it in a cool, dark place. If you choose to bottle water for storage yourself, it’s important to follow a few basic safety rules. Store water only in glass or food-grade plastic containers that have been cleaned and sanitized; two-liter soda bottles are a good choice. Wash containers and lids with hot soapy water and rinse well, then sanitize by rinsing containers and lids with a solution of 1 tablespoon chlorine bleach per gallon of water. Leave the containers wet with the sanitizing solution for two minutes, then rinse them again with water. Fill the containers with tap water, make sure all containers are tightly lidded, mark them with the date, and store in a cool, dark place. Lay In Food Supplies. Stock an emergency pantry that will keep your family going for at least two weeks. A major nuclear accident could potentially disrupt access to electricity and other utilities, so concentrate on simple non-perishable canned or boxed foods that require little or no preparation. Avoid salty foods or snacks, which can increase thirst and put an additional burden on water supplies. Don’t forget to keep two weeks’ worth of canned food for pets, and store dry pet food in sealable glass or plastic containers. Make provisions for light, heat, cooking, and communication. If electric service is interrupted, you’ll need alternate sources of light and heat. Flashlights and battery-powered lamps are the best lighting options, though it’s wise to keep matches and several candles with your emergency supplies. A sterno stove is a cheap, compact, and convenient choice for emergency cooking, and either a kerosene or propane-powered heater can keep a single room tolerably warm. Be sure to store extra batteries for lighting devices and fuel for stoves and heaters. Maintaining communications is one of the biggest challenges in an emergency that involves the loss of electricity, internet connectivity, and phone service. A battery-operated radio can an invaluable source of official information, so make sure you have at least one (and plenty of batteries) stored with your emergency supplies, or better yet, get a hand-crank emergency radio such as the Eton FRX2. Cell phones will operate as long as a carrier signal is available, but only if they’re charged, so keep at least one portable charging device plugged in and at the ready. The first and most important thing to do in case of a nuclear plant emergency is to seek out and follow official instructions. If evacuation is ordered, leave without delay, but if you’re advised to remain in place, do so. Though your gut instinct may be to flee, evacuation isn’t always the best option for safety following a nuclear accident; wind and weather conditions can significantly increase the danger presented by a release of radiation, as can the amount of time that has elapsed since the emergency began. If you get a shelter-in-place order or are simply not ordered to evacuate, there are several steps to take to maximize your safety at home during a nuclear emergency. Get all pets and people inside the house immediately. Go to a basement area or windowless interior room if possible. Lock windows and doors and turn off all sources of air intake, including air conditioning, heaters, and furnaces. Close air vents and fireplace dampers. Seal your shelter room. Use duct tape and heavy plastic to seal cracks and spaces around doors and windows and to close off vents. Keep lines of communication open. Tune your TV or radio to local Emergency Alert System stations, and use your telephone only if absolutely necessary. If there’s any chance that you’ve been exposed to radiation, act quickly. If you’ve received decontamination instructions, follow them immediately. If you believe you’ve been exposed to hazardous radiation but haven’t received decontamination instructions, take a thorough shower and change clothes and shoes. Put the clothes and shoes you were wearing when exposed into a plastic bag, seal it, and put it well outside of your home. 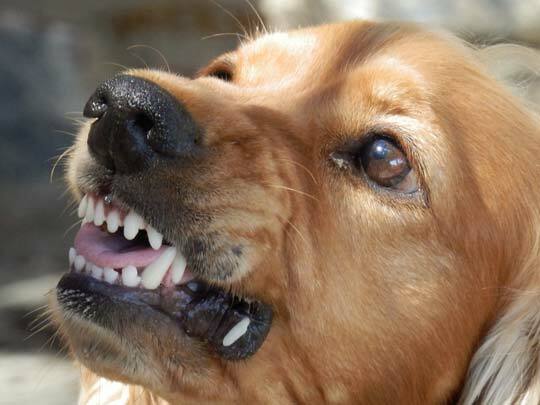 If pets were outside and could have been exposed to radiation, shampoo and rinse them thoroughly. Seek a public shelter if necessary. If you’ve been told to evacuate but don’t have transportation, or if you haven’t been ordered to evacuate but feel it’s unsafe to remain in your home, you may be able to get to a public shelter. If you’re located in the United States, the US Department of Homeland Security says you can text SHELTER + your ZIP code to 43362 (4FEMA) to find the nearest shelter in your area (example: shelter 12345). The enormous potential of a nuclear power plant makes even the thought of a reactor accident terrifying, but in fact the evidence over more than 50 years of nuclear power shows that it is a safe and reliable means of generating electricity; the risk of accidents is already low and is declining as technology improves and safety measures and regulations expand. Most importantly, your own actions and attitude play an enormous role in seeing you and your family safely through a nuclear emergency. Staying calm and alert, having an advance plan, and seeking out and following emergency instructions can be your best safeguard. Natural disasters are a rare and terrifying but undeniable fact of life. Sometimes it’s possible to “bug out,” or leave the area before disaster strikes, but fleeing isn’t always an option. In those cases, being prepared to shelter at home, or “bug in,” can help ensure that you and your family through safe and sound. Large-scale disasters like floods, hurricanes, tornadoes, and even massive winter storms can grind life as we know it to a halt, posing tremendous dangers and sometimes creating enormous damage and devastation. Critical services like water and electricity may be interrupted, leaving you without heat, light, or sanitation facilities. Even short-distance local travel may be impossible, making ordinary amenities like grocery stores, gas stations, and medical facilities inaccessible. Coping with these conditions for even a brief time requires some advance preparation, but with reasonable foresight and careful choices, sheltering safely at home is feasible for most families. The US and Canadian governments both recommend that families make preparation for at least three days of emergency survival, and many preparedness experts advise considering three days as a starting point, gradually adding to supplies to enable home sheltering for several weeks or even months. If getting ready to shelter at home for days, weeks, or even longer seems like a big job, you’re right – it’s a very big job, requiring time, thought, foresight, and a certain amount of investment in supplies. But it’s the ultimate security for yourself and your loved ones, and it’s something every family can and should do. On the flip side, being prepared to evacuate, or bug out, is also highly recommended should you need to leave your home in the face of a disaster at short notice. Make sure that you have your bug out bag packed and ready to go. Preparing for an emergency starts long before one is even predicted. Every household should have an emergency plan detailing the initial steps to follow when a disaster occurs. This doesn’t have to be a written plan, but all adults and older children should be familiar with it. A basic initial emergency plan should include gathering all family members and pets inside, getting all cell phones and charging devices fully charged as promptly as possible, being aware of the various communication channels by which you can get official information on the unfolding situation, and monitoring the situation on TV, non-battery radio, and the internet as long as the power stays on. All families should also have a very basic emergency kit, including a flashlight, a battery or crank operated radio, and extra batteries for both; candles and matches or lighter; a multipurpose tool or a knife, a screwdriver, and pliers; some cash; and a three-day supply of all medicines taken by all family members. Store these items together in a bag or box and keep it next to a basic first-aid kit in an easy-to-access area that is reserved specifically for emergency supplies. As soon as you become aware that a disaster is likely or imminent, the emergency plan goes into action. Get all family members and pets indoors immediately, locate your emergency kit, start charging all cell phones and charging devices, and check your TV, radio, weather radio, social media, and any other communication channels for official information and to determine whether people in your area are being advised to evacuate. If you are in an evacuation area, comply with the order if at all possible; it would not be issued unless authorities had reason to believe that staying in place would put you in danger. If you don’t get an evacuation order, or if you don’t become aware of the evacuation order until the disaster is already underway and it’s impossible to leave, get ready to bug in. If you’ve taken the advance steps below, you’ll be prepared to weather the storm. Obviously, the number one concern for bugging in is shelter; being able to stay at least relatively warm, dry, and protected from the elements is critical to survival. Once you’ve identified an emergency plan and packed a basic emergency kit, you can start your bugging-in preparations in earnest, by designating a room or area of your house as your family’s shelter hub. Since keeping a whole house running in an emergency is impractical, particularly if utilities and basic services have been temporarily cut off, it makes sense to specify one room or area that will serve as your bug in “headquarters.” This is your designated shelter hub, and it’s the area in which most activities will take place for the duration of your bug in. If the power goes off, the shelter hub is the area that you’ll be heating and lighting, and it’s likely the room in which you’ll be preparing food, eating, and sleeping as well. In some areas, basements or purpose-built below-ground shelters are commonly used for protection during tornadoes, but experts say an above-ground interior room, windowless if possible, is best for most emergencies. Choosing an above-ground area as your designated shelter hub can be particularly important if flooding is common or even a strong possibility in your area, or if chemical, biological or radiological contaminants are released into the environment. It’s important to select a room that’s large enough to accommodate all family members and pets, along with a non-electrical heat source and sleeping bags and blankets. The designated shelter space should also provide easy access to essential daily supplies of food and water. A family room or den with a wood burning fireplace might be a good choice because it could potentially simplify heating, though that’s not always the case; a fireplace can’t be used if officials say the room must be sealed to keep contaminated air out, and some wood burners can’t be used when the power is off because they require electric blowers for safe operation. If possible, clear out a closet or other storage space in the designated shelter room and dedicate it to storing emergency supplies like water, food, fuel canisters, etc. If no space is available in the room itself, choose a storage area in an adjoining room or at least nearby, and make sure the whole family understands that it is to contain only emergency supplies which must not be used under any other circumstances. If you have a wood stove or wood burning fireplace in your designated shelter hub and have not been instructed by officials to seal the room, you might be able to use the fireplace or stove as a heat source as long as you have wood on hand. However, it’s important to be aware that some wood burners and fireplace inserts cannot be safely operated without having electrically-powered blowers operating, so be sure to read up on your device and determine whether it can be safely operated without electricity. If a wood burner or fireplace isn’t a possible heat source, non-electric heaters that use either kerosene or propane are safe, reliable, and affordable. Either can keep an enclosed space tolerably warm with a relatively small amount of fuel, and both kerosene and propane heaters are readily available in shops and online. Both types of fuel are sold everywhere, and both can be safely stored for several years. Whatever heating device you choose, be sure to get one that doesn’t require any electricity and can heat a space the size of your designated shelter hub. When you purchase the heater, also buy the recommended amount of fuel to keep it working at least ten hours a day for three days. Though you’ll be storing your heater and fuel with your other emergency supplies, set it up and give it a thorough test run well before it’s needed in order to make sure it’s powerful enough to keep your space warm and see if you’ll need additional fuel on hand for a minimum three-day bug in. Getting a good non-electric heating device is important, but it’s just one step toward staying warm while sheltering at home in a cold weather no-power situation. Close off the shelter hub room by closing all doors or covering doorways with heavy blankets. Make sure all windows are completely covered, and add heavy blankets over existing draperies to increase insulation. A prolonged power outage during the winter will quickly make you aware of every draft and cold-air ingress point; plastic sheeting or even heavy fabric tacked or stapled over windows and towels wedged under doors can go a long way toward limiting heat loss. Keep as much activity in the shelter hub as possible during the bug in; not only will it decrease the area to be heated, having people and pets in the room will automatically raise the temperature. Combat cold by wearing multiple layers of clothing, along with hats, gloves, and at least two pairs of socks whenever practical during the day and definitely when sleeping. Make sure there are blankets, quilts, comforters, and sleeping bags for everyone, and be certain that you know exactly where everything is before disaster strikes. There’s nothing more frustrating than shivering through a long night under a blanket, knowing your down-filled sleeping bag is probably crammed into an unmarked box with the tent and badminton net somewhere in the basement. If the power goes out you’re going to need a light source in your shelter hub, along with portable lighting for moving around the house. A wide range of rechargeable emergency lighting solutions, some of which hold a charge for well over 100 hours, are available at surprisingly affordable prices both online and in stores. If you live in an area where even brief blackouts are common, having a couple of these on hand could go a long way toward making everyday life easier, and they’re a great addition to your bug in preparations. Flashlights are invaluable during an emergency, so make sure you have several on hand and plenty of spare batteries. Candles are also cheap, portable, readily available, and can actually contribute to warmth during a power outage, but could potentially pose a fire hazard, so take care to keep them well out of reach of children and pets when in use. Camping lanterns, both battery and propane operated, are affordable, reliable, and portable. Optional, but recommended: In the event of widespread power failure, one of the first items that people rush out to buy are gas-powered generators. They sell out quick in the event of an emergency and having one in advance as a precautionary measure can go a long way in helping you stay comfortable. They are options that are stationary and need to be installed by a professional that are capable of powering an entire house or you can opt for a portable generator, such as the WEN 56200i, that is less powerful but can still come in handy for charging cell phones or running a small space heater. Next to having a secure shelter, access to sufficient drinkable water tops the list of bug in necessities. Water is absolutely crucial to survival, and going without it can be fatal in as little as three days. While water can be easily and affordably stockpiled and securely stored for emergency use, there are decisions to make about how you want to proceed. Though not all emergencies have a negative impact on the availability of drinkable water, it’s by far safest to assume that you’ll need to have stored water on hand during a bug in. There are basically three approaches to stockpiling water supplies: you can buy bottled water, you can bottle tap water from your own well or municipal water service, or you can collect rain water in a large barrel, then purify and bottle it. Buying commercial bottled water is the simplest and most convenient method of stockpiling water, but it’s also the most expensive. Collecting rain water in a barrel is probably the cheapest method, but it’s time-consuming and labor intensive. The most feasible and affordable method for most people is simply filling sanitized plastic soda bottles with tap water. It’s important to note that not all plastic bottles or containers are safe for long-term water storage; for example, milk containers aren’t a good choice because they’re biodegradable and will eventually start to break down, plus it’s difficult to be certain that every trace of the original contents have been completely removed. Soda bottles meet the safe-storage criteria of being made of UV-resistant food-grade plastic so start the stockpiling process by saving your empties (or ask friends and relatives to save empties for you, if you don’t drink soda). For maximum efficiency, larger is better, and two liter bottles are ideal. When you’ve accumulated a few empties, wash each bottle and cap well with hot water and dish detergent, then sanitize both bottles and caps inside and out with a bleach and water solution (one teaspoon unscented household bleach to one quart of water). Rinse the sanitized bottles well, then immediately fill them with tap water. If your water comes from a municipal service and is chlorinated, you don’t need to add anything, but if your water comes from a well and is unchlorinated, add one or two drops of unscented household bleach. Cap tightly, write the date on the outside of the container, and store in a cool, dark place. If you have the space and budget for special water storage containers, many shapes and sizes are available. Commercial water containers run the gamut from drums and tanks capable of holding 55 to 100 gallons to small, super-portable rectangular containers, such as the WaterBrick, are designed for maximum stackability. How much water will you need to store? The US Federal Emergency Management Agency says you should have at least one gallon of drinkable water per person per day, so a family of four would need an absolute minimum of 12 gallons of water for a three-day bug in. Nursing mothers or people with medical conditions may require more daily water, and if you have pets, you’ll need to add stored water for them, too. How long can you store water? Technically, water in sanitized, sealed containers can be stored indefinitely. Water doesn’t expire or go bad, and though it can develop a stale taste after long storage, it’s still safe to drink. However, FEMA recommends that all non-commercially bottled water should be emptied and replaced every six months. Even if you have ample water stored for an emergency, it’s a good idea to fill your bathtubs with water as soon as it appears that a disaster scenario is imminent. This water could come in very handy as a supplemental supply if your water service is interrupted for a long period of time, if sewage service is unavailable, or if your well becomes contaminated. Stockpiling storable, low-prep food is not only a must for emergency scenarios, it’s also a smart move for anyone who lives in an area prone to ice storms, heavy snowfall, torrential rains and flooding, or any other weather-related situations that can interrupt electric service and curtail travel even temporarily. Making home-cooked meals from scratch using only fresh ingredients is a great idea most of the time, but an alternative dinner source will come in very handy on those nights when the family is famished, the power is off, and the roads are impassable. The trick to successfully stockpiling food is making the right choices. You need items that have a very long shelf life, don’t require special storage conditions like freezing or refrigeration, and can be eaten as-is or with an absolute minimum of preparation. That eliminates a lot of the standard dietary staples like bread, meat, dairy products, and fresh produce, all of which spoil relatively quickly. But just because something has a long shelf life, that doesn’t mean it’s a good candidate for short-term emergency food; both rice and dried beans are all but eternal, but they require a lot of preparation. There are several options for emergency food supplies, including special dehydrated food packets typically used by backpackers and campers, and even military-style MREs, or Meals Ready To Eat, which come with water-activated heating packets. Both are designed to supply plenty of calories and nutrition. They’re also compact, portable, and very easy to store. However, all that convenience doesn’t come cheap, and dehydrated food isn’t always available locally, though it can certainly be ordered online from many reputable vendors. The simplest and most affordable option for most people is to stock the emergency rations right from the shelves of the local grocery store. Canned or vacuum-sealed goods can be an excellent choice; canned or vacuum sealed tuna and chicken are long lasting and pack a lot of protein, and canned mini-franks, chili, stews, soups, pasta, fruits and vegetables all have a relatively long shelf-life and can all be eaten with minimal preparation (or even no preparation whatsoever). Buy an extra manual can opener and keep it in your emergency storage area. You may also want to stock a few cans of fruit and vegetable juices, which have a long shelf life. Having them on hand can keep the kids happy and help make your water supplies last longer. And speaking of canned liquids, store a few cans of evaporated milk; you can add it to other foods to improve flavor and texture, and it makes a good creamer for coffee or tea. Dried foods like oatmeal, macaroni specialties, Ramen noodles, soup packets, quinoa, and grits can be prepared by just adding hot water. Powdered milk, which has a long shelf-life and is very versatile, is also a good choice for your emergency stores. Nuts and nut products, including peanut butter, have a shelf life of about a year and can provide a lot of flavor along with some necessary protein. Be sure to stockpile standard peanut butter rather than the new “natural” types, which have a much shorter shelf life. Don’t forget to store instant coffee and teabags, both of which can provide a welcome lift during an emergency situation. If you have a baby, be sure to store several days worth of canned or powdered formula, and lay in plenty of both canned and dry food for your pets. Important: start your bug in by using up whatever “everyday” food you have on hand that can be eaten with little or no preparation, and use up the most perishable items like milk, bread, lunchmeat, cheese, yogurt, and fruit first. You don’t want to break into your emergency supplies until you have to; if you’re lucky your power will be restored before you’ve emptied the fridge, and if you’re not, at least your food hasn’t spoiled and gone to waste. Emergency Kitchen Supplies: If your bug in lasts for more than a day, you’ll need some means of heating water and perhaps warming canned foods like soups and stews. Propane camp stoves are a great choice; they’re affordable, reliable, efficient, and come in several sizes. But even if you have a great camp stove, don’t count on doing a lot of cooking during a bug in – remember, the idea is to store foods that require little or no preparation. You don’t want to use any more fuel than absolutely necessary, and remember that cooking requires clean up that will drain your water supplies. And speaking of cleanup… since you’re sheltering at home, you definitely have access to plenty of plates, cups, silverware, etc. But even if your water supply is uninterrupted, do you want to cope with heating water to do the washing up in a no-power situation? If you’re using your regular kitchenware, it’s either that or dealing with a growing mountain of dirty dishes where your sink used to be. The solution is simple: buy a few packs of heavy-duty disposable plates, cups, and bowls, and a package of disposable spoons to store along with your emergency food supplies. Add a couple of multi-packs of paper towels and use them to clean utensils, wipe out pans and bowls, etc. Miscellaneous extras: These items aren’t necessarily kitchen-related, but they’re all important, and it’s a good idea to store them with your emergency food supplies, so you know exactly where to find them when you need them. Stockpile several multipacks of toilet paper and boxes of tissues; several boxes or rolls of large heavy-duty garbage bags; an extra bottle of whatever non-prescription headache and pain relievers your family uses; some additional dental care supplies (toothpaste, dental floss, denture adhesive, etc. ); a couple bottles of hand sanitizer; a can of dry shampoo; extra deodorant; and at least a week’s worth of disposable diapers if there’s a baby in the family. In an absolutely worst-case scenario, it’s possible that sewage systems could fail. A prolonged power outage could shut down the electrically-powered pumps that keep water flowing to tanks and toilets, and when that happens the results can be devastating. If you think that’s some kind of alarmist nightmare scenario that couldn’t really happen in first-world modern life, think again: in 1998 the city of Aukland, New Zealand suffered a five-week power outage that cut off water and sewage facilities to tens of thousands of apartments and offices. In 2005, Hurricane Katrina left New Orleans’ sewer disposal system, pumps, and water treatment center submerged under 20 feet of water and parts of the system were inoperable for weeks. If a disaster causes the grid to go down, the immediate concern is how to dispose of human waste. A non-electric self-composting toilet could be the answer if you have the budget and space for it, but in most cases, you’ll need to find other ways to deal with the situation. If you have an individual septic system with your own septic tank, you can flush even when the pumps are down by removing the lid from the back of the tank, filling the tank with water till it reaches the level of the float, and then pressing the flush lever. Remember the tip to fill your bathtub when you know that a disaster is imminent? This is a very good use for that water. Alternatively, if you live in a rural area, going outdoors is an option (albeit one that few people will consider as a first recourse, particularly during a severe weather emergency). If you do decide to try this option, dig a roughly 6″ by 6″ hole at least 200 feet from any water source and well away from any rain water runoff. When you’re done, use the dirt you removed to refill the hole and cover the waste. If you don’t have your own septic system and going outside isn’t feasible, it’s important to determine whether the municipal sewage main is working. If you’re sure the sewage main is operable, you can flush by adding water to the tank, the same way you would if you had an individual septic system. However, if you know (or even strongly suspect) that the sewer main is down, don’t flush your toilet. Doing so could potentially make it possible for sewage to back up into your plumbing. When the sewer main is down, you’ll have to collect and dispose of the waste you and your family generate. Start by removing as much water as possible from the toilet, then put one heavy plastic garbage bag inside another and open them, creating a single double-layer bag. Raise the toilet seat and position the open doubled bag so that it fills most of the cavity of the toilet bowl, then tape the top securely to the underside of the toilet seat. Keep a large bag of cat litter in easy reach of the toilet. After use, cover the waste in the bag with a liberal amount of litter to reduce the smell. After a few uses, or when the bag-covered bowl is about 2/3 full, add more litter and a bit of disinfectant (like a mild chlorine solution) if available. Tie the bag securely and move it to a sealable temporary container like a garbage can, placed well away from the shelter hub. If this sounds like more than you can handle, you may want to look into online outlets and specialty stores that cater to campers, which offer small self-contained portable waterless toilets along with odor-controlling bags and deodorants. But even with these amenities, disposal is going to be a must and failing to do so could result in unbearable living conditions at best and potentially deadly illness at worse. Dealing with human waste in a no-water-no-power situation is a serious business that can’t be taken lightly. This article deals primarily with sheltering at home during a natural disaster or weather emergency, so arming oneself, determining vantage points for defense, and other extreme security measures really aren’t applicable. However, it always pays to be reasonable about security, and there are some steps you should take to make sure you and your family are safe during your bug in. Get an extra set of car keys made and keep them with your emergency supplies. If you have an electric garage door, be sure you know how to open it if the power is off. Lock your doors and windows as soon as you’re sure an emergency is imminent. If possible, contact friends or relatives who are in a location that won’t be affected by the emergency and let them know what’s happening in your area and what your plans are. Get your cell phones and charging devices plugged in and charging as soon as possible. This is actually a very important security measure; a phone can be can be your lifeline in a desperate situation. If your area is under an evacuation order but leaving is impossible, do everything in your power to get in contact with authorities and let them know that you’ll be sheltering in pace. If someone comes to your door claiming to be a city or municipal representative, ask for identification before you grant entry. Once you’re sure you’re heading for emergency conditions, do as much as possible to get your shelter hub prepared (covering doors and windows, locating sleeping bags, setting up your heat and lighting devices, etc.) while you still have power – don’t wait for a blackout to get started. Everything is twice as difficult and takes much longer to accomplish when it’s cold and dark. If the power does go off, you’ll be ready. If it doesn’t, you can consider it an excellent practice session and have a good laugh about it. Stay calm. This is important in any case, but it’s absolutely vital if you have children in your household. Youngsters pick up adults’ vibes with amazing speed, and if you’re tense and terrified, they will be too, and the whole experience will be worse than it has to be. Staying calm also makes you far more resourceful and responsible, improves your memory and dexterity, and generally helps you take care of everything that has to be managed during a bug in. If you’ve ever spent more than a day or so living through an emergency that trapped you and your family in a cold, dark, powerless house listening to the elements rage outside, you know that it’s an extremely challenging emotional situation. Having a way to stay warm and a good stock of emergency supplies on hand can make it a lot easier, but every day that goes by without a return to normalcy will erode your courage and your spirits unless you really make a sincere and sustained effort to stay positive and hopeful. 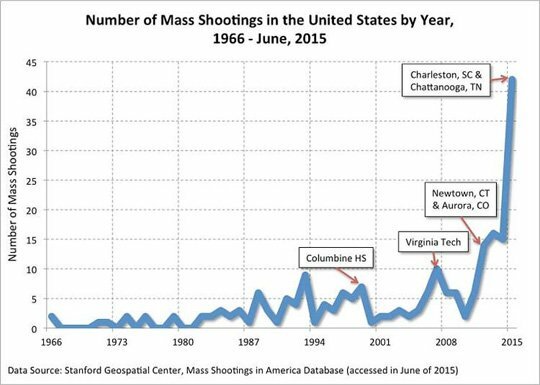 The bad news is that there’s no way to predict how long an emergency situation will last. Depending on the nature of the emergency, power outages can range from a few minutes to a few weeks; getting a municipal sewage system back into operation after a major flood can take well over a month. The good news is that you can be certain that the authorities are doing their utmost to solve problems, often starting even before the disaster actually strikes, and situations that require a full bug in of more than three days are relatively rare. The trick to getting through a bug in is to tread the line between a fun indoor camping vacation and life as usual; you’re going to need elements of both to survive with your sanity intact. Do whatever you can to keep some kind of routine in your life. Try to eat meals at the same time as you normally eat, put children to bed at the usual hour, and resist the temptation to either utterly relax discipline or become exceptionally strict and demanding. Sticking to the usual schedule and tenor of life as much as possible will help everyone stay calm and cooperative. At the same time, you have to be realistic about the constraints of the situation. Adults won’t be able to go off to their jobs, so the whole family will be together 24-7. Going outside to play will probably be out of the question for both children and pets, so you might have to find ways to deal with excess energy. Ordinary daily hygiene routines will have to be abridged to accommodate the inability to shower or shampoo, which might be fine as far as the kids are concerned, but can make adults exceedingly cranky. One of the major challenges for modern people in a bug in situation is dealing with the absence of the entertainment sources we take so much for granted, like TV and the internet. The alternatives – books, games, puzzles, etc. – may initially be greeted with strong protest, but try to stay patient and positive about the options. Even if you have battery-operated games, DVD players, etc., it’s probably a good idea to put them out of reach or at least limit their use; while they will help pass the time, they’ll gobble up your emergency battery supply and as long as you’re in a bug in situation, there’s no way to get replacements. Don’t be surprised if everyone (including you) has periods of moodiness, irritability, restlessness, or depression; bugging-in during an emergency is a strange and uncomfortable situation involving chores and challenges that no one is emotionally ready for. Be prepared to spend some extra time reassuring children that the situation is temporary and everything will eventually return to normal. If you happen to have chronically ill or elderly people in your bug in family group, be prepared to be reassuring with them as well. Emergency situations create feelings of helplessness and fear in everyone, and people who are very old or who have physical problems can feel particularly vulnerable. Perhaps most importantly, don’t forget to take care of yourself while bugging-in. Sheltering at home has many benefits, but it’s also an extremely demanding way to ride out an emergency, particularly if the power goes off and your regular water service is unavailable. In many ways, bugging-in is a kind of return to pioneer living, but it can be pretty hard to feel exhilarated by overcoming the challenges when the kids are fussy, the dogs are whining to get out, a can of cold chili is the only thing on the dinner menu, and you haven’t had a shower for days. But you’re at home and you’re together; focus on that when the going gets rough. Rest whenever you can. Stay as warm as possible, and eat enough to stay healthy. Take a multivitamin every day. Hunt up a book of crossword puzzles or a couple of those novels you’ve been meaning to read, and treat yourself to your own personal flashlight for at least a few minutes of quiet distraction each night. And above all else, keep reminding yourself that everything is eventually going to be fine, and rest assured that you’re doing everything you can. I don’t know about you but I’m what the French would call “lazy”. However, I like to think of myself as “efficient”. By which I mean to say, I prefer to do the least amount of work for the most amount of return. Smarter people than me refer to this as the Pareto Principle a.k.a. The 80/20 Rule. I don’t know if you read bolded words in a big, booming voice in your head but that’s how I meant it. The 80/20 Rule states: You should aim to achieve 80% of the results with 20% of the work but the last 20% will take 80% of the work. How Can The 80/20 Rule Help Me Survive? I know, I know. You came here to learn about bug out bags and survival skills, not principles and rules and such. But bear with me, I’m going somewhere with this. 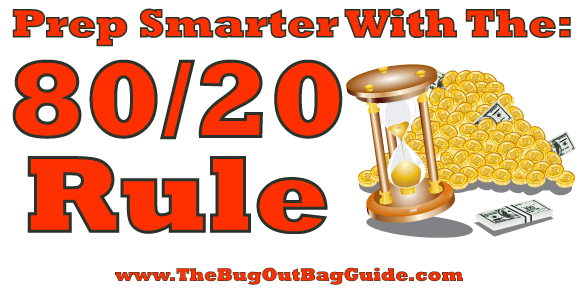 We can apply the 80/20 Rule to bug out bags as well. If you’re on this site, you probably already know how important bug out bags are and why you need them. But raise your hand if you actually have one. Now look up and see if your hand is raised. If not, read on. If it is, you can jump down to the Weight section. Let’s start with what to pack. For a lot of people just getting into prepping, putting together their bug out bag is kind of overwhelming. Hell, I wrote a BOB checklist that had almost 100 items on it! And that still wasn’t everything. Yes, you can go buy a $200 pack and drop another $500 in gear. And it would be totally worth it. But did you know that you can get 80% of the way there and 1107% more prepared than you already are without spending a dime? If you’re like most people, you’ve got most of the supplies you need to survive already lying around your house. Because you’re surviving right now. All you’ve got to do is put all that stuff in a bag. Sure, you’ll probably need to buy some items to be fully prepared but I bet you can survive for a while just on what you can put together in 30 minutes from what you already have. Here is an article covering this topic specifically (click here to see it), but I will summarize here to make it easy on you. A lighter kit will let you travel further and faster before exhaustion sets in. Why should you care about your bug out bag weight? The weight of your pack is one of the main factors determining how far and at what speed you’re able to travel. A heavy BOB will cause you to burn more energy and sweat more, thus requiring more food and water. And when you’re tired and sore from lugging that thing across Kingdom Come, your morale plummets. Click on the button now to make your bug out bag list and see how much it will weigh! But there are some very easy tricks you can do to get rid of a lot of that weight while still keeping 80% of the functionality. First, comfortable shoes are a must when bugging out. But they don’t do much good if they aren’t on your feet. So either put them on or toss them but don’t take up precious space and weight with a pair of “just in case” hiking boots. Second, water is important. But you don’t need to bring a week’s worth with you. Knowing how to find and purify water is an essential skill you should know anyways. If you want to learn how, just Click HERE Now. A bottle (16 ounces) of water clocks in at 1.05 pounds. So if you’re able to get rid of a spare bottle, you’ve just shaved a significant amount of weight off. Keep a bottle or two with you (unless you don’t plan on being around a water source for a while) and ditch the rest. Water is HEAVY! Bring a little and plan on foraging on the way. Image credit Lisa Risager on flickr. Third, while food is important, unless you’ve already gone through your original supplies and are forced to scavenge, stay away from cans. The goal isn’t to have as much food as possible, it’s to have as many calories as possible. Basically the opposite of your diet. Protein bars – I like these, they taste awesome and are long lasting. I usually keep one in my EDC bag for a snack when I am on the run but they are well suited for a bug out bag also. Fourth is shelter. If you plan on bugging out in a non-urban environment, shelter is pretty important. There are two categories to focus on when cutting your shelter weight; what you’ve got and what it’s made out of. And what you can change or leave behind will be based very heavily (pun intended) on your specific situation. For example, I live in a very hot, humid area. If I had to bug out, chances are low that I’d need a thick sleeping bag but they’re pretty high that I’d need something to keep the rain away. So in my instance, I decided to ditch the typical tent and sleeping bag and instead went with a lightweight hammock and rainfly. I’ve got a comfortable place to sleep and something to keep me dry (plus the hammock has mosquito netting which is essential in my region). And it all weighs less than 3 pounds. So to lighten your load, you either need to switch out what you’re carrying, like trading a tent for a tarp or sleeping bag for a yoga mat, or buy lighter equipment. There are “ultralight” tents and sleeping bags that weigh next to nothing but perform just as well, if not better, than their portly cousins. If you go this route, make sure you choose your gear carefully, ultralight equipment can cost upwards of ten times the price of regular gear! No, not the final frontier, I’m talking about room in your bag. If you followed all the rules from the weight section, you should have quite a bit more room for other essential items. Take a look at the largest items in your bug out bag and ask yourself if you really need them or if there is a smaller alternative. Wrap duct tape around a pencil or your water bottle so you don’t have to carry a whole roll. Remove items from packaging, if possible. Attach your flashlight and knife to the outside of your bag (especially if your backpack has MOLLE webbing). This will free up space and make them easier to deploy in a hurry. Now that you’ve cleaned out the excess, don’t go throwing more crap in there just because you can. Leaving a bit of space might be a good idea, especially if you plan on scavenging along the way. Personally, I would use that extra room for more socks and underwear. You may laugh at that but let me tell you from experience, you do not want to walk numerous miles a day, for multiple days, without a change of socks. Or undies. Plus they’re light, have a number of uses, and disposable if you find a cute snow globe at the gift shop. So that’s the 80/20 rule and some ways you can use it to improve your preparedness. Once you get used to thinking this way, you will see you will be able to apply it to nearly any aspect of life to get the maximum results with the minimum effort! Did you learn anything new? Were you able to apply any of these to your bug out bag? Got some more tips to add on optimizing your prepping? Let us know in the Comments Section below, thanks! 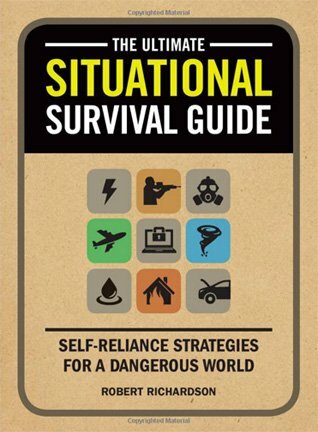 Evan Michaels is the chief editor at Know Prepare Survive. When he’s not rambling about survival skills and bug out bags, he can be found hiking (or, as it’s called in Florida, walking), fishing, and just generally being a cool dude.